I moved my Easy DIY Fall Centerpiece to my old ironing board behind the couch. I told you it would be somewhere in my house all season! I didn't add much in here but I never really decorate my living room for fall. I mostly keep it all in the dining room and kitchen but this year I decided to move into here a bit. I'm so ready to light that fireplace up this winter... You can read about how I made over my fireplace here. The round pillow on the little couch was thrifted, the plaid one is just a cover off of Amazon, and the last one is from Target. I love getting covers for pillows that way you can change them out for the seasons without getting new pillows. Super cheap way to make a big impact on a room. I have a lot of people ask about our slipcovers and I got them on Overstock a while ago. I love them because they're super easy (well as easy as a slipcover can be) to take off and wash. Having kids can get messy so being able to throw these in the wash is super convenient. My husband got me the black and white pillows from Ross I believe a while back. The other ones on the big couch were thrifted except for the same Target one on the left. I had a ton more pictures but my camera took them blurry for some reason.... But maybe that's a good thing because I can go super crazy sometimes with pictures. I got that candle at a local wedding venue where our good friends got married. I have to go back and get more because they are THE BEST candles ever and this one is running low. The mugs I got at Walmart and all the pumpkins are from Marshalls except for the little brown one and that is from Tuesday Morning. The coasters are from TJMaxx as well as the table (which will be getting a makeover soon) the cotton stem is from Amazon, the "gather" place mat is from Target Dollar Spot and the tray was thrifted. I hope you enjoyed this little start to my Fall Home Tour. The kitchen and dining room will be up soon! Don't miss it! 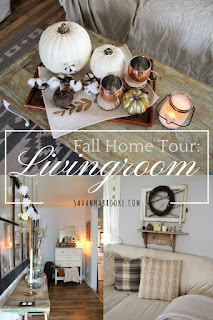 I hope you got some inspiration for your own home to cozy it up for this season and are enjoying every bit of fall. As always thank you for stopping by to see what I'm up to! Have a great weekend, friends!